Ceramic tiles distribution was the core idea that sparked during May 1997, which was nurtured, trained, encouraged, collaborated and shared in a modest area of 400 sq. ft. Thus began the journey of the distribution of integrated products for the construction industry - residential to commercial, retail and industrial sectors. To better the services, an 800 sq. ft. retail outlet with 4000 sq. ft. warehouse space expanded at Brooke Bond Road during March 2000. Lakshmi Ceraamics went into expansion mode again during 2003-04 to create a 7000 sq. ft. display showroom at Brooke Bond Road, empowering customers to see, feel, compare & choose products to their utmost satisfaction. Kajaria, Somany, Nitco, RAK, Cera, Johnson, were among the many brands that were showcased. To cater clients beyond Coimbatore Lakshmi Ceraamics opened up branches at Tirupur, Karur, Trichy, Karaikudi and Madurai and maintains the biggest display area in those towns. A truly world class shopping was endorsed by the Company during August 2010, at the inauguration of South India’s largest showroom for ceramic digital wall & floor tiles, designer & vitrified tiles, sanitary ware, CP fittings & accessories, wellness products, kitchen sinks, water heaters, tanks & pressure pumps. 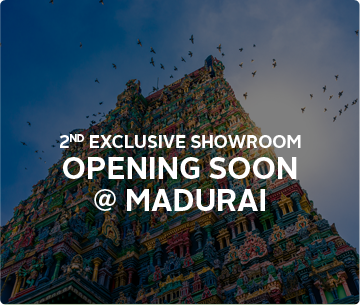 The sprawling showroom at Mettupalayam Road, with 20,000 sq. ft. of display area in a single floor, centralised AC with 50 car parking facility is the first of its kind that broadens the spectrum of product offerings.